This expose is by Justice Markandey Katju, who was chief justice of Madras high court before becoming a Supreme Court judge. He is now chairman of the Press Council of India. 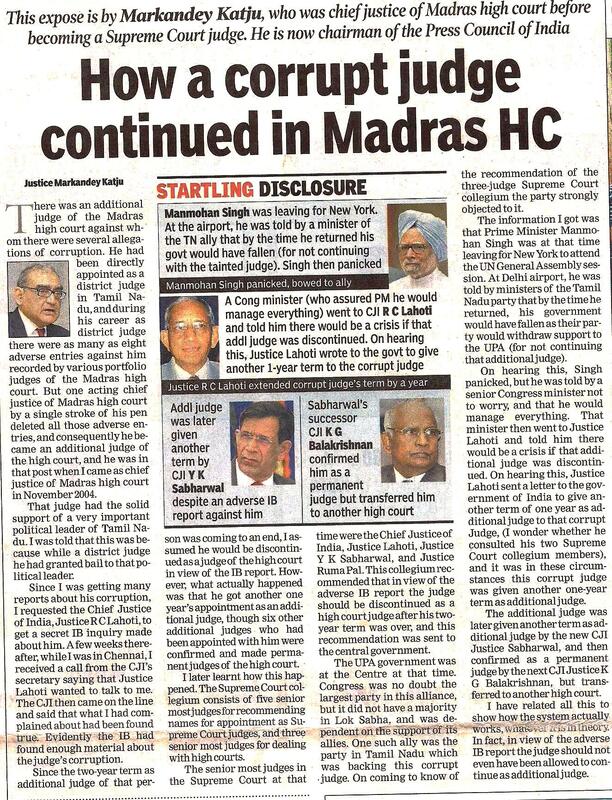 There was an additional judge of the Madras high court against whom there were several allegations of corruption. He had been directly appointed as a district judge in Tamil Nadu, and during his career as district judge there were as many as eight adverse entries against him recorded by various portfolio judges of the Madras high court. But one acting chief justice of Madras high court by a single stroke of his pen deleted all those adverse entries, and consequently he became an additional judge of the high court, and he was in that post when I came as chief justice of Madras high court in November 2004. That judge had the solid support of a very important political leader of Tamil Nadu. I was told that this was because while a district judge he had granted bail to that political leader. Since I was getting many reports about his corruption, I requested the Chief Justice of India, Justice RC Lahoti, to get a secret IB inquiry made about him. A few weeks thereafter, while I was in Chennai, I received a call from the secretary of the CJI saying that Justice Lahoti wanted to talk to me. The CJI then came on the line and said that what I had complained about had been found true. Evidently the IB had found enough material about the judge’s corruption. Since the two-year term as additional judge of that person was coming to an end, I assumed he would be discontinued as a judge of the high court in view of the IB report. However, what actually happened was that he got another one year’s appointment as an additional judge, though six other additional judges who had been appointed with him were confirmed and made permanent judges of the high court. I later learned how this happened. The Supreme Court collegium consists of five most senior judges for recommending names for appointment as a Supreme Court judge, and three most senior judges for dealing with high courts. The three most senior judges in the Supreme Court at that time were the Chief Justice of India, Justice Lahoti, Justice YK Sabharwal, and Justice Ruma Pal. This Supreme Court collegium recommended that in view of the adverse IB report the judge should be discontinued as a high court judge after his two-year term was over, and this recommendation was sent to the central government. The UPA government was at the Centre at that time. Congress was no doubt the largest party in this alliance, but it did not have a majority in Lok Sabha, and was dependent on the support of its allies. 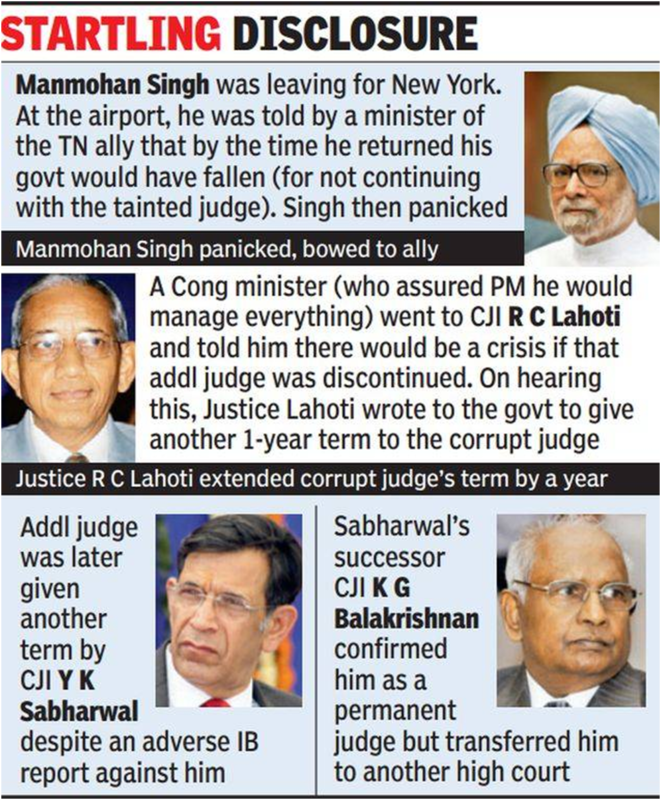 One such ally was the party in Tamil Nadu which was backing this corrupt judge. On coming to know of the recommendation of the three-judge Supreme Court collegium they strongly objected to it. 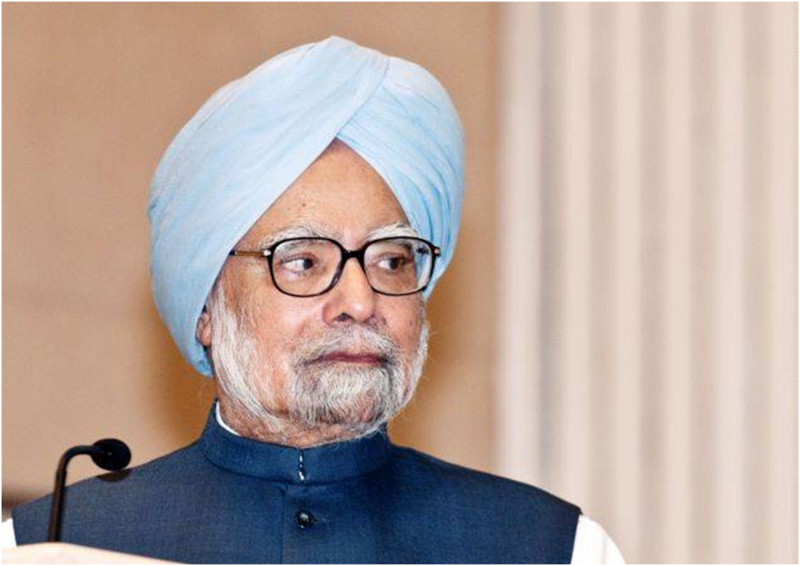 The information I got was that Prime Minister Manmohan Singh was at that time leaving for New York to attend the UN general assembly session. At the Delhi airport, he was told by ministers of the Tamil Nadu party that by the time he returned from New York his government would have fallen as their party would withdraw support to the UPA (for not continuing that additional judge). On hearing this, Singh panicked, but he was told by a senior Congress minister not to worry, and that he would manage everything. That minister then went to Justice Lahoti and told him there would be a crisis if that additional judge was discontinued. On hearing this, Justice Lahoti sent a letter to the government of India to give another term of one year as additional judge to that corrupt judge, (I wonder whether he consulted his two Supreme Court collegium members ), and it was in these circumstances this corrupt judge was given another one-year term as additional judge (while his six batch mates as additional judges were confirmed as permanent Judges). The additional judge was later given another term as additional judge by the new CJI Justice Sabharwal, and then confirmed as a permanent judge by the next CJI Justice KG Balakrishnan, but transferred to another high court. I have related all this to show how the system actually works, whatever it is in theory. In fact, in view of the adverse IB report the judge should not even have been allowed to continue as additional judge. Coming from a forthright judge like MK for whom I have the highest respect and regard, one doesn’t need to check on the veracity of the story. It does show the independence (or its erosion)of the highest levels of judiciary in a worrisome light. My only question to MK is when did he come to know of these details with certainty and why did he not blow the whistle much sooner, if this (as seen apparently) had happened long ago.